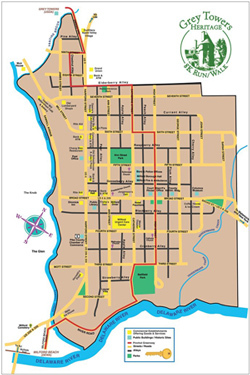 Please note that runners will be running on open streets and a portion of the race is along a dirt road. The course begins at Grey Towers National Historic Site in Milford, PA follows the Pinchot Greenway through the historic Borough of Milford, travel down to Milford Beach and returns to Grey Towers for an awards ceremony. 100% of the proceeds from the 2017 8K Run/Walk will be used for public programs and projects that support the GTHA mission at Grey Towers of assisting the Forest Service in education, improvements, promotion, conservation, and wise use of Grey Towers National Historic Site. Sponsors will be listed on our website as a Supporter and invited to our Annual Holiday event for Supporters and Friends. Click on the buttons below to support and donate.